Thermaltake Core V31 Enthusiast Case. Thermaltake are famed for their CPU coolers, power supplies and their cases. Now we see that a new case has been introduced into their enthusiast range. 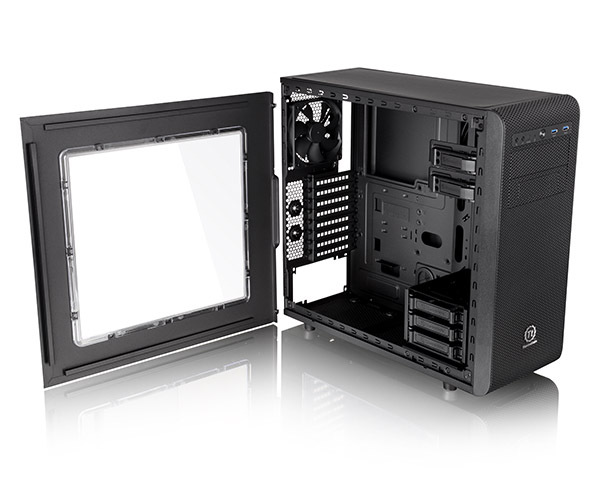 The Core V31 is a mid-tower chassis with a window and Thermaltakes own LCS Certification. This case is placed in the market between the V1 and V51. You may be asking' What is LCS Certification?'. It is not an industry standard. Let's get that clear. It's Thermaltakes way of saying that this case is aimed at those who enjoy to watercool their system, both AIO and DIY solutions. It's basically a process that Thermaltake put a product through to decide whether it's truly compatible with extreme watercooling solutions. Thermaltake believe that this case provides ample space for all your high-end hardware and plenty of room for expansion. This case retains the same curved mesh front, as the rest of the 'Core' series. The perforated top and bottom panels come with dust filters which will help keep your system clean. From the picture, we can also see that there is a lot of ventilation in the back. Not only is there a fan, but there's also extra perforation. Within the perforation, there's 2 holes which you can use for feeding watercooling tubes through. The rubber feet keep the case well away from the ground. The overall design of the case is quite dull. There isn't anything exciting in the way that this particular case looks. 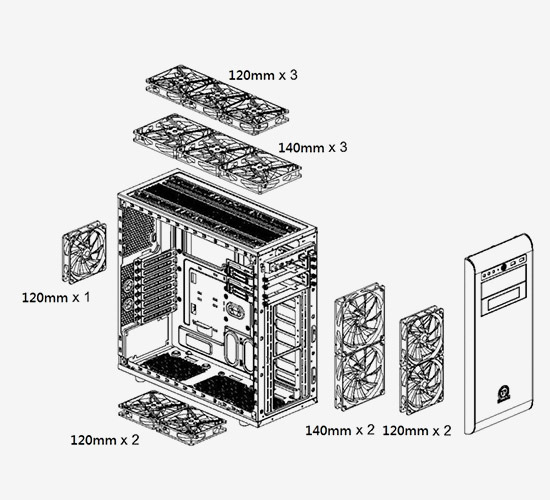 The exterior is much like any other mid-range ATX chassis so, early on, we can aleady see that Thermaltake have gone for function over fashion. With so many cases on the market which can easily have a watercooling loop installed, it's surprising that there isn't anything, design-wise, to tempt people over to this chassis. The side window is quite standard and lets you see everything. Manufacturers like NZXT are starting to hide the HDD bays in their case, and even offering a shroud to hide the PSU. Even on the S340 - a budget option - there's some thought into making the case look good. Once the side panel is removed we can see there is a tool-free design. A customizable 5.25" & 3.5" drive bay feature enables users to freely interchange the 3.5" hard-drive cages to suit their particular needs, whilst being able to remove the 5.25" & 3.5" drive bays to gain maximum interior space, should they wish to have an internal pump/reservoir. This modularity is very clever and shows that more thought went into the internals of the case, rather than the looks. This does raise the question of where HDD's do sit, should you remove all the drive bays. Disappointingly, there doesn't seem to be rubber grommets on all of the cable management holes. Again, this will boil down to cost, but affects the looks significantly. 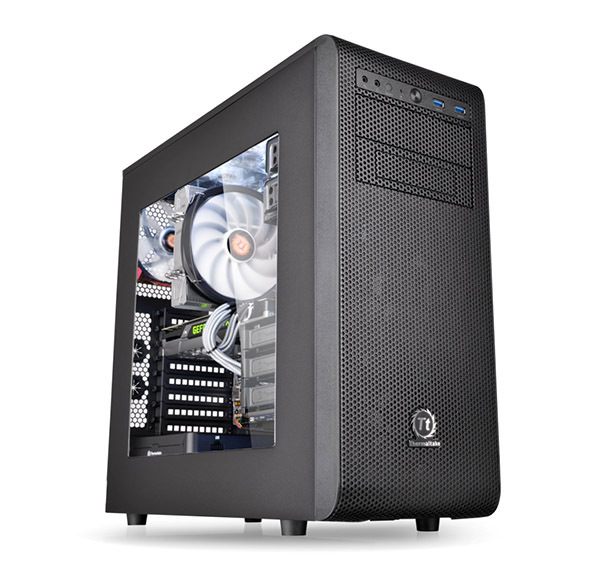 Thermaltake also state that their LUNA, PURE and Odin fan series are all supported in this case. This is a good move as, sometimes (not too often) there can be confusion as to whether a certain fan will be too thick or have too many plastic bits sticking out, to actually be compatible. The next image illustrates fan compatibility. If water cooling is more your thing, there is plenty of radiator support, showing where this case really stands out. Again, Thermaltake quote that their Water 3.0 Ultimate, Extreme, Pro and Performer series AIO cooling solutions are fully supported on the front and top panels, with Pro and Performer supported on the rear. None of Thermaltake's AIO coolers are supported on the bottom. It wasn't long ago that the Water 3.0 series was released so it seems to make sense that a case supporting a wide range of these coolers is released. It seems that Thermaltake has positioned the Core V31 at inbetween 2 markets; Those who like extreme watercooling and those who aren't particularly interested in looks and just want their PC to be cool (thermally) and probably stay out of sight. 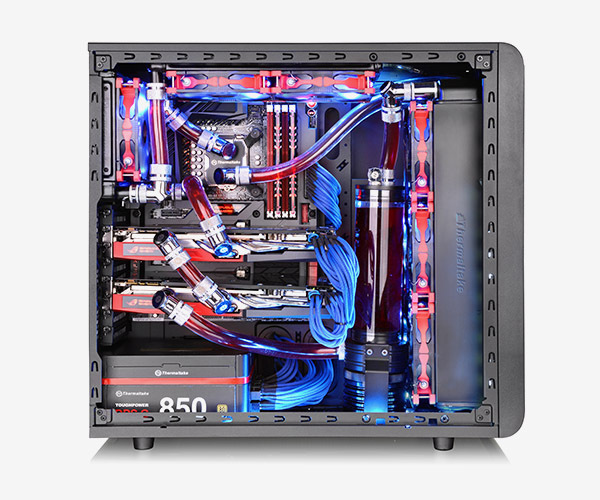 I'm sure there are people out there who this case appeals to but it seems like you can't turn your head without being presented with a chassis that provides a lot of watercooling options. But do any offer as much flexibility as this? I'm not so sure. Fully loaded, this case does look good (of course there's a lot of thought gone into how the press images look) but for me, the exterior design is sub par and there's no where to put the HDD's when it is packed to the brim. With no word on pricing, you have time to decide if function over fashion is for you. If it is, then maybe this is your next chassis. Join the discussion on Thermaltake Core V31 on the OC3D Forums.